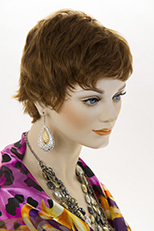 Striking Flapper 20's style bob wig with bangs! Dramatic, straight, jaw length bob with straight across bangs. The hair is shorter in back at the nape and longer in front. Also, available in fun party colors. See item details for available colors. Striking and arty! 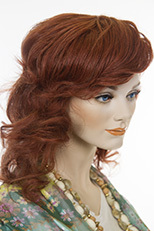 Medium, shoulder length, tight spiral curls, shaped to the head. The hair is made from the finest modacrylic Kanekalon fiber. See item details for available colors. Dramatic, glamorous, long, curly, wavy, wet look, gypsy style layered, shag wig, which is 28 inches in length and has long side swept bangs which are 12 inches. 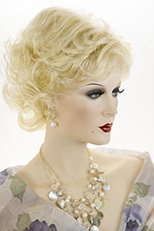 The hair is made from the finest modacrylic Eleora fiber, origin Japan. 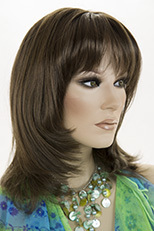 Wig Secret features, premium quality, natural looking wigs, which are adjustable to fit most head sizes. Young and chic! Short, straight razor cut wig with a partial skin top, bangs and flipped up ends. See item details for available colors. 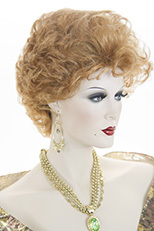 Long, straight, wavy, layered, glamorous, show girl style costume wig. Length is approximately 22 inches. See item details for available colors. 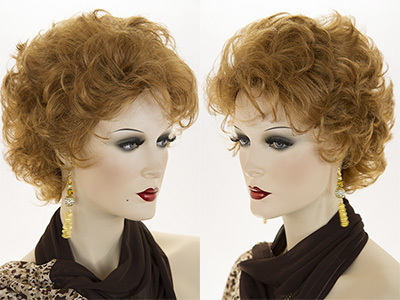 Stunning curly, ringlet, shag, gypsy style wig. The hair is shaped to the head and is approximately 7 inches in length curled. See item details for available colors. Premium men's toupee! Monofilament and hand tied! The base size is 6.75 inches by 9 inches. The straight, wavy hair is made from the finest modacrylic Kanekalon fiber, origin Japan. The hair length is approximately 7 inches in length. See item details for available colors.